Achieving that voluminous celebrity hair style is now a reality with flip-in hair extensions. If you have ever felt that your locks lack length, density, or simply don’t have that oomph, extensions are the answer to all of your problems. The reason why many girls choose to go with a flip-in or one piece hair extensions is because of the instant results and their temporary nature. You don’t have to wear one piece extensions every day and all the time, just put it on when you feel like it or for a special occasion. You will be amazed how easy and straightforward it is to install it. That’s also the reason why one piece extensions are recommended for beginners who don’t have that much experience with applying hair. Maybe you just want to try it out and don’t want anything permanent. That’s when we definitely recommend a one piece. Our flip-in pieces are also perfect for busy women on the go. Your hairstyle will be ready in just a couple of minutes, but it will look like it took hours. For our experienced users, one piece is great because of its simplicity. You can even it combine it with other extension methods! Despite what you might think, glamorous and extra-long hairstyles are not reserved only for famous actresses and singers because you have it too! All of them use literally the same extension tricks in order to be able to change their hairstyle often and go from short to long instantly. Once you try our one piece extensions, you will see for yourself how amazing they are and how easy it is to look like a real diva. Because these are one-piece extensions, you will get them as one big bundle of hair. That’s also what makes it unique among all other extension types and methods. What’s special about it is the gorgeous body wave texture. Straight hair is beautiful, but it can sometimes look a bit flat and boring. That can definitely be avoided with our body wave one piece extensions. The loose waves flow so nicely and create an effect of even more volume. And the best thing about is that you won’t need to style your locks as much. A body wave looks pretty much perfect as it is, so there is no need to curl your strands all the time and damage your locks. Our hair professionals are one of the top one’s in this business and we’ve work hard together in order to come up with the best extensions possible. We know the needs of customers, as well as all the ins and outs of the hair business, and that is what enables us to create a high quality product. Take a look at some of the best features of our one piece, flip-in extensions. 1. We are delighted to let you know that our new and improved one piece extensions now come with a loop, which makes them so much easier to attach, and also more durable and secure. 2. All of our extensions, including the flip-in, made using only the highest quality, Remy wavy hair. When you run your fingers through the gorgeous wavy locks, you will feel amazing softness and silky surface. 3. The abundance of colors and shades to choose from is another great feature of our one piece extensions. We are sure that you will find the right one for you. 4. Our new and improved one pieces tangle less so you don’t have to worry about matted hair. 5. If you travel a lot, AiryHair one pieces are so easy to pack and take everywhere with you. 6. Need to go to a date or dinner right after work? Not a problem with flip-ins, you can install them on the go and be ready in minutes. 7. Dreaming of amazingly long locks that reach lower back? Choose the 30 inch one piece that will wow everybody. 8. Even if you are a complete beginner, you will be able to attach one piece extensions in mere minutes. 9. Our special body wave flip-in is extra glamorous and make you look like a superstar. 10. No matter how many times you wash the strands, the body wave will not go away and will still look like the first time you bought it. Should You Buy Double-Drawn Hair? If you know a thing or two about extensions, you have probably heard about double drawn hair and know that it’s the best option out there. We recommend that you always go for quality in order to have the best hair experience possible. For those of you who are hearing this term for the first time or are not quite sure what it means, double drawn hair means that it has been thoroughly inspected and all the little hairs are picked out, leaving only long and healthy ones. When it comes to double drawn hair, you can forget about thin and rough edges, you will get equal density from top to bottom. And that’s not something you get from single drawn hair. Why We Use Remy Hair? If you’re buying hair that you want to wear all the time and have that natural look, everything else fails into comparison when it comes to Remy hair. It is the standard of hair that will please even the most demanding customers. Non Remy strands are stripped of their cuticles, often by using harsh chemicals, and that results in low quality tresses that tangle up in a matter of minutes. Remy hair has all the cuticles intact and all hairs are checked so that the cuticles face the same direction. 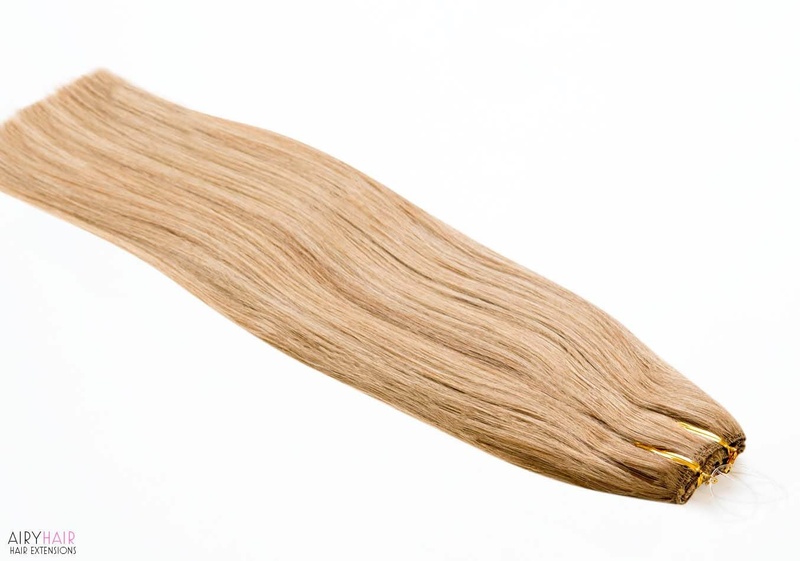 So for a few extra bucks, you can get one piece extensions made out of genuine Remy hair and enjoy the incredible wavy texture and silky surface. How to Apply One-Piece Hair Extensions? If you are looking for the easiest to apply extensions out there, you have come to the right place. Perfect for absolute beginners, as well as pros who want an amazing hairstyle instantly and without much hassle, one piece body wave is a breeze to attach. By following this simple guide, your glamorous look will be achieved in less than five minutes! 1. Before installing your one piece, you should prepare your natural tresses first. Wash your hair and comb it thoroughly. If your strands are not naturally wavy, use a curling iron to create a nice body wave so that everything blends together immaculately. 2. Moving on to your one piece flip-in, brush it as well before application. 3. Place the flip-in onto the crown are and first make sure that it fits snugly. If the circumference of the piece is too large, you need to cut the loop and shorten it. 4. Put on the flip-in again and when you’re happy with the placement, grab a comb with a pointy end or a similar tool. 5. Start pulling out your real strands from underneath the loop. You want to use your hair to cover up the one piece extensions. Do this carefully and follow the string around your head. 6. Check one more time if everything looks good and voila, you have just installed your one piece wavy extensions. Now you can enjoy them and show off your new lustrous locks to everyone! If you thought that applying one piece body wave extensions was easy, you will be delighted to know that removing them is even simpler and can be done in minutes! 1. Start by combing your locks first. You don’t want any tangling or knots when you start removing the extra hair. 2. Using your fingers, find the loop at the top of your head. Grab it and carefully pull it away, to the back of your head. 3. If you feel any resistance, don’t tug or pull aggressively. Simply remove any tangles or knots and try again. 4. Safely store your flip-in body wave and it will be ready for you to reinstall any time you want! To ensure longevity and avoid any damage, take good care of your one piece body wave. All of the steps are very easy to do and for a couple of minutes each day, you significantly increase the lifespan of your new hair so don’t avoid these simple tips. 1. The first step to healthy, silky, and lush extensions is regular brushing. It is recommended that you do it a couple of times a day, especially before washing or styling. You can also invest in a professional detangling brush that is perfect for removing all knots from your strands. 2. The key to successfully washing your once piece is using the right shampoo. We recommend a sulfate-free, gentle shampoo that won’t be too harsh on your new tresses. If you want to be completely safe, there are many products made specifically for use on extensions. Your hairdresser can also recommend you what to buy. 3. Since you can remove your one piece, it makes it a lot easier to actually wash. You can use your bathroom sink, fill it up with warm water, add shampoo and submerge the hair bundle. Massage it gently and you can even let it sit for a while before rinsing. 4. After you have rinsed out the shampoo, apply a leave-in conditioner on the extensions. Let them sit for up to twenty minutes. Rinse out again with warm water. 5. Wrap the flip-in in a dry towel and press on it to remove the excess water. Now lay the bundle on another dry towel and let it air dry. 6. If you don’t plan on using the once piece body wave every day, store the hair in a dry and cool place, away from the sun. That way, your extensions will always be ready to wear at all times! If you live anywhere it the North America region, Australia, Great Britain or other European countries in the west, we have great news for you. Your one piece body wave extensions will arrive at your door in ten to thirty days completely free of charge! If you like this amazing shipping option, choose free international shipping by registered mail! Another great method is the EMS shipping. The package will be yours in just four to eight business days! For extra fast delivery, go with FedEx/TNT/DHL shipping. All the packages will be delivered as fast as one to four business days. The same regions apply for the last two shipping options. We usually need one day or less to prepare your order and send it out. If we come across some unforeseen problems, like the post office not working, the handling time can be extended up to three days.